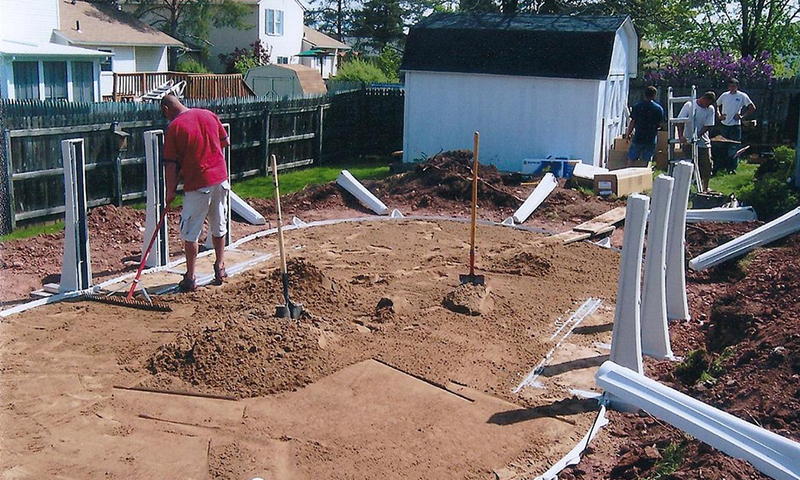 The first step in building a swimming pool is making a plan. You must choose your site carefully, while remembering your budget restrictions as well as local Town Codes that are in place. Above ground pools are a fantastic option for those who want the enjoyment of a pool without investing the time and money required for an in ground pool. Above ground pools can be built as round or oval shapes in a number of sizes to suit your backyard, and can be finished with a variety beautiful design-inspired liners to give your pool a custom look. 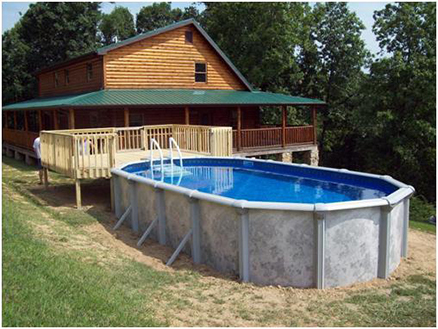 These pools can be installed quickly, and can be easily dismantled and transported if you ever move to a new home. These decisions above will need to be well thought out before your above ground pool becomes a reality. Although Above Ground Pools are not permanent structures, they do serve as a focal point in your backyard for years to come. Be sure to spend the time and energy necessary to create an environment that will last a lifetime! How will you use your swimming pool? Do you want to relax, participate in healthy exercise, or entertain friends and family? Defining the uses now will help you choose the best location for your pool and aid in deciding on the style, size, shape and accessories to be installed on the pool that meet your needs. Potential Pool Owners will have to consider the financial aspects of pool ownership. If the pool is attractive and not highly specialized, it will be considered an asset. Don’t forget to factor maintenance into the cost of the pool that you choose. Routine pool maintenance will include keeping the water chemically balanced and sanitary, maintaining the pool filter equipment, cleaning/vacuuming the pool, opening/closing the pool. You can contract Liverpool Pool and Spa to perform these services, or you can do some or all of them yourself. In addition to yard dimensions, considerations need to be made for the yard’s slope, soil type and accessibility for construction equipment. Pools are easier to build or install when a yard is open and level. Severe conditions such as steeply sloping lots, rocky soil and limited access require special construction and installation considerations and typically add to the overall cost and duration of the project. Consulting with Liverpool Pool and Spa will aid in determining which shape and size would best suit your needs and whether or not it would actually be possible to construct a pool in your desired location. Once you have determined the yard size and conditions as well as what your pool will be used for, you can begin to design your pool space. 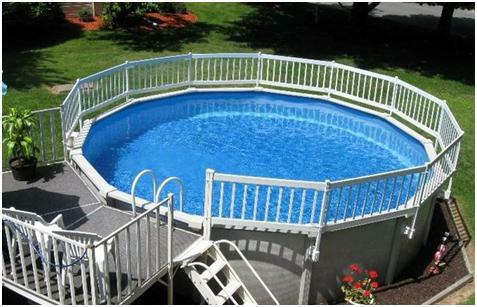 When you choose to build an above ground pool you can add customized features, such as wood or composite decking. Be sure to remember to design the entire backyard scope: including landscaping, pool features, patio/deck area and fencing. 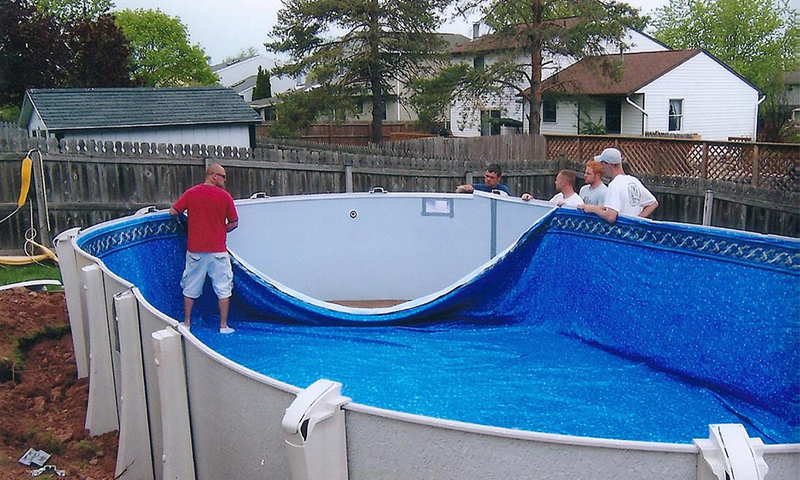 Consulting Liverpool Pool and Spa is a good idea to help you determine which size and shape would be an ideal fit for your particular yard as well as determining possible maintenance costs. Liverpool Pool and Spa will be responsible to have the most up to date zoning and building codes for swimming pools to aid the customer with acquiring a Building Permit. Zoning is primarily handled on a local level and typically covers such issues as fencing and barriers, set-backs and proximity to utility lines. It is very important when choosing a professional pool contractor to do your research. When interviewing possible builders, determine the number of years they have been in business, ensure that they are bonded and insured, visit the showroom to view examples of their work, and determine if they subcontract the work or use their own staff. By selecting the correct pool supplies for your needs, maintaining a gorgeous pool all season long will be an absolute breeze. In addition to choosing the correct maintenance equipment that suits your needs for the pool, safety equipment is also necessary for the pool. Many specialty safety products are available on the market, including water alarms (NYS Law) or lockable Step and Ladder Systems. 6’ of access into your site will be made to begin excavation. The pool layout will be marked out prior to the dig by our Above Ground Construction Coordinator so that you can protect any landscaping or trees near the excavation area as well as know the exact placement of the pool. Liverpool Pool and Spa will help the customer gather all of the necessary building permits, and then the equipment will be brought in to dig the hole. After 24 hours, weather permitting, the LPS site crew will deliver and install the pool. Liverpool Pool and Spa’s Foreman and crew will set and secure the steel or composite structure of your pool with concrete footing blocks to keep it level. 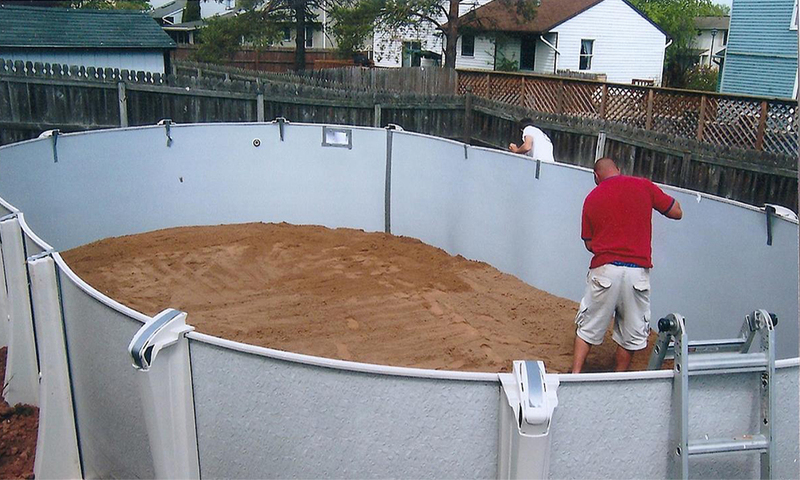 Then the bottom of the pool will be shaped and smoothed with sand. The liner will then be set and checked for proper fit. The plumbing system will be positioned, and then the hired electrician will ground the pool perimeter and any necessary wiring will be installed. At this time the pool will be filling with water! From start to finish, this process will take approximately ½ to 1 Day, depending on the shape and size of the pool, weather permitting. Once the pool is filled with water, homeowners will be able to backfill the dirt around the base of the pool and the finish work can begin around the pool perimeter. Finish work can include topsoil, decorative stone, landscaping, standard pressure treated wood decking and/or composite decking up to the pool’s top rail edge. Any decking structure must be coordinated by the homeowner and proper permits must be obtained. All swimming pools work in the same manner – no matter the shape or size. They all use a combination of filtration and chemical treatment to constantly clean a large volume of water. Water pumps in a continual cycle, from the pool through the filter, chemical treatment system and back to the pool again. 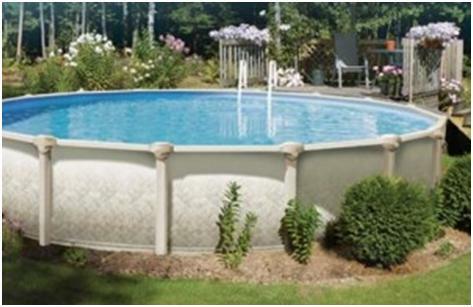 The filter system helps keep the water in the pool free of dirt, debris and bacteria. Heaters are sometimes used to keep the water at a desired temperature. One of the most common questions customers ask is “how much does it cost to build an above ground pool?” The answer to that question can vary based on the slope of the yard, size/style of pool, added features, etc. There is truly no simple answer. However, the most accurate way to get an answer to that question is to get a professional quote from one of Liverpool Pool and Spa’s low pressure Sales Consultants. Liverpool Pool and Spa will also coordinate with all other aspects of the job (Electrical work, fencing as needed, landscaping, etc.) to make sure the entire budget is decided based on the full scope of the project before work begins. Financing is available for the pool project. Liverpool Pool and Spa works with local banks to finance the project at great rates to those who are searching to make the backyard project as affordable as possible. The size of your swimming pool is the biggest factor in determining the price. Round Pools are the most economical and have various diameters available (15’ Round-30’ Round), which take up less space in the yard. Oval Pools are also available and generally are a higher price point due to the labor intensity and hardware required for construction. The length and width of the pool determines the square footage, which determines the price of the pool. The size of the pool also determines the water volume required to fill the pool. 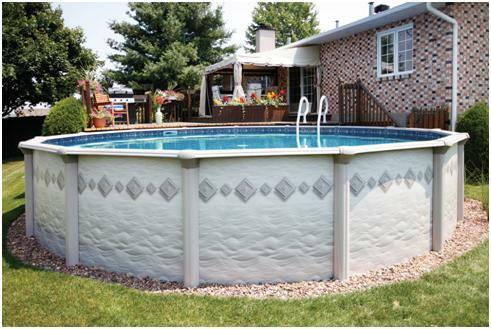 Above Ground Pools can be purchased in 52” or 54” wall heights to meet local code requirements. Please contact a Liverpool Pool and Spa sales associate for further details on code requirements prior to purchasing your pool. The location and grade of the property may factor in the overall budget required to successfully build an In Ground Pool. Generally, the flatter the yard, only the standard included requirements would be needed to build the pool. However, steeply sloped yards will require planning by our excavator to provide additional digging and grading. Sometimes, drainage and/or retaining walls may be required, which will increase the overall cost of the pool project and a landscape company may need to be coordinated to complete the area around the pool. 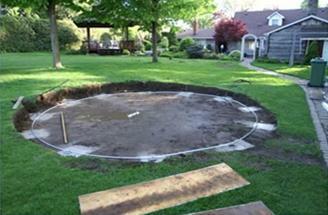 If you are looking for an Oval shape, you can expect to pay more for your swimming pool. Through the design and construction process, the extras that you add to your pool really customize it. Sometimes the “extras” can cost as much as the pool. You can add features such as decking, landscaping, or recreational add-ons such as pool lighting and sporting games (Basketball/Volleyball). You also don’t want to forget energy efficiency options such as solar covers, energy efficient pumps, filters, heaters, and saltwater chlorinators. We care about our customers and take the time to educate you though the entire process. To learn more, or take the next step towards getting the your above ground pool of your dreams contact us today!